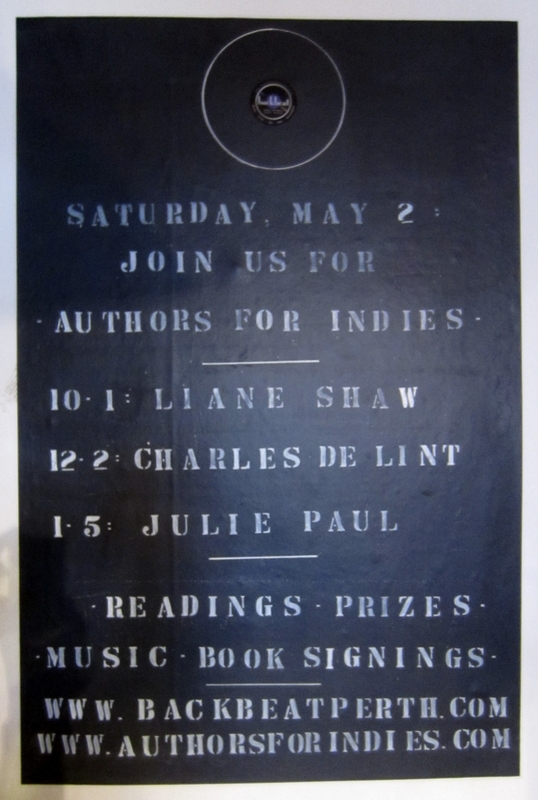 From 10 am – 1 pm, author Liane Shaw will be joining us. Liane is a former teacher based nearby in Lanark. She’s written three YA novels, but for her latest book, she’s forayed into non-fiction with Time Out: A Teacher’s Year of Reading, Fighting and Four-Letter Words. I read this book in one sitting. It was so compelling, I couldn’t put it down and I highly recommend it. Come by and meet this author whose real life has oftentimes been stranger than fiction and congratulate her for coming out the other side still smiling and in one piece. From 12 – 2pm, Charles de Lint (Ottawa-based author of over seventy adult, young adult and children’s books) will be joining us with his wife MaryAnn Harris. This multi-talented couple will be starting off their shift with a musical set. Afterwards, Charles will do a short reading from one of his books. I had the pleasure of meeting them recently and they were both so humble, kind and down-to-earth. Plus they have a dog called Johnny Cash, so you know they’re awesome. I recently read his book Where the Desert Spirits Crowd the Night and highly recommend it for its dreamlike settings and characters. From 1 – 5:00 pm, we will be welcoming Julie Paul to our shop. Julie is formerly from Lanark Village, but hands-down wins the distance prize for visiting us all the way from Victoria, BC. She is the author of two short story collections and I after reading her latest book The Pull of the Moon, I know exactly why it was included on the Globe and Mail’s Top 100 Books of 2014 list. Its quirky characters and tone were so fun to read. It is the best short story collection I have ever read, which is why I highly recommend this book. It also contains very good food for thought re: selecting family pets, which is invaluable advice for anyone really. At 4 pm, Julie will be doing a reading from The Pull of the Moon, so come on by and help us welcome her home. During their visits, these three amazingly talented and generous authors will be recommending their favourite books. They’ll be on hand for book signings, conversation and advice. Ask them whatever you like – find out what inspires them, how they got to be published authors, what they do for fun. And no celebration would be complete without fun stuff like freebies, giveaways and prizes, so we’ve got that covered as well. Next Post Record Store Day and our 2nd “Re-Birthday” weekend sale. April 18-19-20, 2015.